OnLive, which is most easily described as a Netflix for video games, is getting into a new business today: remote Windows desktops and cloud storage. Beginning with the iPad and then expanding to Macs, PCs, iPhone, Android, TV, and Google TV (with a Bluetooth keyboard and mouse), OnLive will offer streaming access to a Windows 7 desktop with Microsoft Office apps like Excel, Word, and PowerPoint. Working in much the same way as the company’s streaming game service, users of the service will be able to access their desktop from any device. Better, it will have a free version and files stored in the cloud will be accessible from any Web browser. Surprised? We are too, but the way OnLive CEO Steve Perlmann describes it, the move into productivity cloud software makes a lot of sense for OnLive. During a phone interview he told us that streaming video games is a lot more demanding than a Windows desktop and that most of the streaming technology OnLive has been perfecting for the last few years can be easily applied to this new business. Better, since peak usage times for desktops is from about 8am to 5pm on a weekday, there is virtually no overlap with peak usage times for OnLive’s video game streaming service, which doesn’t start heating up until after 6pm on a typical day. This lets the company use the same servers for dual-services. Here’s how it will work: The OnLive Desktop will be available for the iPad App Store tonight. Once installed, you have to register for a free OnLive account (unless you have one already) and login. There is a free version which comes with a Windows 7 desktop, 2GB of cloud storage, and three basic Office apps (Excel, Word, PowerPoint). You can use this as much as you want, but you can’t browse the net on it or install applications. Also, the free service is on a first-come, first-serve basis, meaning if OnLive’s servers are packed, you may have to wait to get access. The “Onlive Desktop Pro” pack fixes most of these limitations. For a $10/month fee, you get priority access, 50GB of cloud storage, can browse the Web and install apps on your virtual Windows 7 desktop, and get other “OnLive-unique” features. An Enterprise version will also be available that will offer business owners even greater flexibility and control. The iPad version of the app, launching today, also supports touch-based controls for Windows. You should be able to find it in the App Store tonight in the US and UK. The question is, how threatening is this to cloud storage services like Dropbox and remote desktop software like Citrix? By offering users a completely new desktop environment, OnLive seems to be carving out a new category. 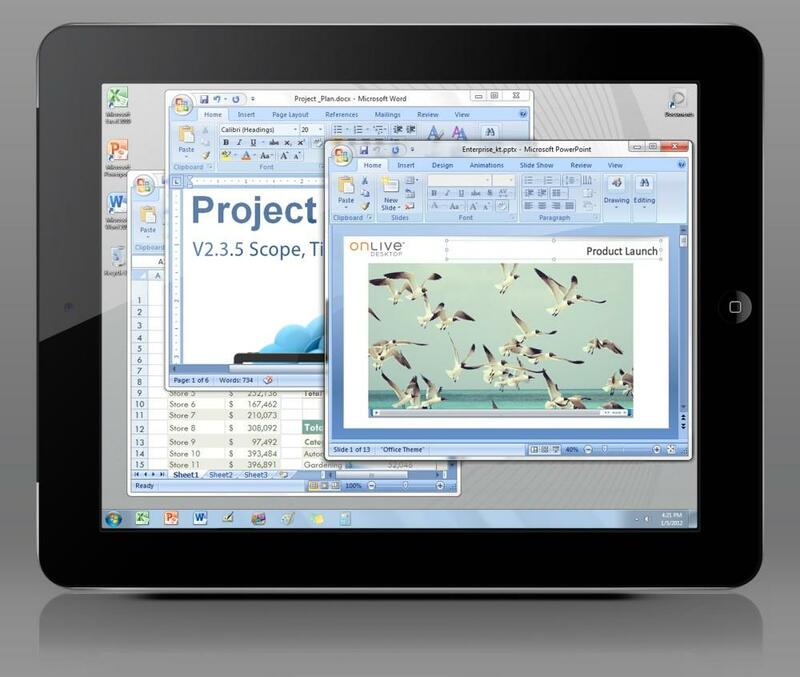 Would you use a streaming service for access to Microsoft Office apps?